When getting shredded, Scott tweaks his plan to force his body to respond quickly. To see how he keeps his body functioning like a well-oiled machine, check out his cutting regimen. When getting shredded for an upcoming fitness event, Scott Dorn tweaks his already strict training and nutrition plan to force his body to respond quickly. By increasing the intensity in the gym and reducing his calorie intake, Scott can be in premier shape in a matter of weeks. To learn how Scott keeps his body functioning like a well-oiled machine, check out his cutting regimen. I use whey protein because it is quickly absorbed by the body. I use whey for my first meal of the day, and my pre and post workout meals. Casein protein is absorbed at a much slower rate than whey protein. I use casein before bed, and at times I won't be able to eat for long periods of time. I use fish and flax oil to get essential fats the foods I'm eating may not contain. I use caffeine as an energy supplement. I use HMB to help with muscle recovery. Regardless of your fitness goals, it's critical to take the time to educate yourself on proper nutrition. Nutrition is a major part of every human beings life. Anything done as frequently as consuming food should be understood on a higher level. Take a bit of time to learn what you're eating; after all you are what you eat. I would recommend checking out one of the many documentaries on the current food industry and its future. I personally like to stick to natural, non-processed foods. After making the switch to high quality foods, I have yet to find a person who has had regret other than wishing they had made the switch sooner. Don't get me wrong, creating a quality nutrition plan that works for you is no easy task. However, it's an essential part to any successful exercise program. I eat 6-8 small meals spaced between 2.5-3.5 hours throughout the day. Each meal contains a protein, carbohydrate and fat source. The ratios of each are determined by body weight and goals at that time. There is plenty of debate on the correct ratios for each, but I keep protein between 1-1.5 grams per pound of body weight, carbohydrates are typically between 0.8-1.8 grams per pound of body weight, and fats are roughly between 0.2-0.35 grams per pound of body weight. I like to incorporate carbohydrate cycling in my nutrition plan. If I'm in a muscle building phase I lower my protein and fat amounts and increase my carbohydrate amounts. I then do five high carbohydrate days and two reduced carbohydrate days, ideally keeping reduced carbohydrate days to non-training days. When I am in a dieting or cutting phase, I increase my protein and fat sources and lower my carbohydrate sources. I then do five low carbohydrate days and two high carbohydrate days. There is one way to determine what ratio works best for you and that is by using trial and error. Determine your goal, track your nutrients and adjust them based upon the results. Yes, it can be mind boggling at first, but like anything the more you do it the easier it becomes. My training strategy is based around the theory of progressive overload. Simply put, progressive overload is the theory that in order to force a muscle to grow you need to continually increase the level of stress placed upon the muscle each workout. If the level of stress is not increased, your muscles will not grow. Increasing the level of stress placed on the muscle can be accomplished in several ways. Below are some of my favorite ways to increase stress levels. All of my workouts are structured around a combination of the priority principal and the isolation principal. I prefer to work muscle groups that are lagging, or that are of higher priority earlier in the week. I train one muscle group each day, with the exception of leg workouts. I find this allows me to focus my effort; getting the most from each workout. Each workout starts with a compound exercise in order to utilize the maximum amount of strength while the muscle is strongest. Then I pick an isolation exercise to hit each head of that muscle. I feel it's vital to target each head of each muscle group in order to fully develop the muscle. My supplement philosophy is very simple. I use supplements to fill in any gaps that whole foods leave or to replace whole foods when life doesn't allow me to use them. I explain what supplements I use and how I use them in the above sections. 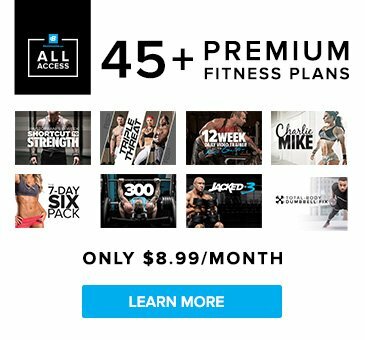 Get access to over 45 premium fitness plans from the world's best trainers, athletes, and experts for only $8.99 a month!